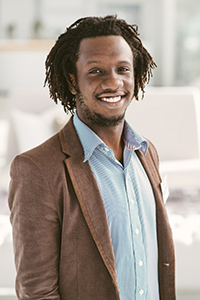 Alexander is a Bioengineer at heart and is currently working as UI Engineer at Barclays Africa Design Office. He mentors design & dev interns, writes code and on occasion does some design work. Alexander is passionate about learning, developing young talent and all things digital. Alexander obtained Computer Engineer at Tuks (University of Pretoria) and followed it with an Honours Degree in Bioengineering. He’s currently working on his Master is Bioengineering. Alexander lectured in Computer Science and Electronic Engineering at the University of Pretoria from 2012 until the end of 2015 before moving to join the Africa Design Office at Barclays Africa. Alex also worked at the SAP research lab from mid 2010 till mid 2013 as a frontend developer and researcher. Alexander runs a small design and development agency, Musketeers, servicing small to medium clients. He is passionate about entrepreneurship and is part of two startups, Needtyres and Jobox. Needtyres launched in 2017 and has a globally distributed team. Alexander also spent 3 months as a remote marketing intern at the startup Find A Great Nanny (Australia). Alexander’s next adventures include BYMing as Board member, BMXing as newbie, learning visual design, and completing his masters in bioengineering.